Emergency Medical Evacuation includes medical due to outbreaks, epidemics, threat of natural disaster, even political evacuation due to civil unrest (treated separately), and emergency medical evacuation to the nearest qualified medical facility that can handle the medical condition. It includes expenses for reasonable transportation (either public transport or private as reasonable based on the condition) resulting from the evacuation; and the cost of returning to either the home country or the country where the evacuation occurred. Sometimes it also includes remote transportation in the event of a diagnosis of a critical medical condition which is not necessarily immediately life-threatening, but severe enough that it could result in death or a permanent disability if not treated right away. Any medical treatment(s) are usually paid from your medical insurance benefit, after your deductible is met (that’s the part you agree to pay before medical coverage kicks in). It may also include an Emergency Reunion Benefit, or Return of Minor Children. That’s just one of the many benefits included in travel medical insurance, usually for around $1.00 to 2.00 a day depending on your age. Sometimes, travelers are confused by Trip Cancellation insurance usually offered by their travel agent or airline or cruise line. That is another type of coverage altogether and usually much more expensive (depending on your trip and cost). Here we are strictly talking about emergency medical insurance when away from home/western medical facilities. Holidays should be fun for everyone. When making vacation plans, especially if you’re traveling internationally, don’t forget to get insurance coverage for you and your loved ones. Of course, we always hope you have no obstacles while traveling, and do not need to call your emergency number, but you never know what could happen. If you are on vacation in an isolated place, and suddenly you are attacked by a disease or become a victim of violence, then you might need medical evacuation. Or, you could accidentally step off a curb and tear an ACL. Or worse yet, get hit by a car. You can choose three types of medical evacuation services, by land, air or sea. Medical evacuation by land is usually reserved for someone who is not in critical condition, and only requires standard medical equipment such as an ambulance. This type of medical evacuation would be more effective for someone who wants to move from one hospital to another hospital in the same city. Medical evacuation by air is usually reserved for someone who has a critical condition. And Medical evacuation by sea is usually reserved for someone already on a ship. Usually the ship already has competent medical personnel, but a person needs more help then what they can give, so a sea evacuation is used, by helicopter or rescue ship. Many people do not consider the importance of travel insurance when making travel plans. But medical disasters can happen anywhere and at any time. Therefore, affordable international travel insurance with medical evacuation benefits is very important to have! 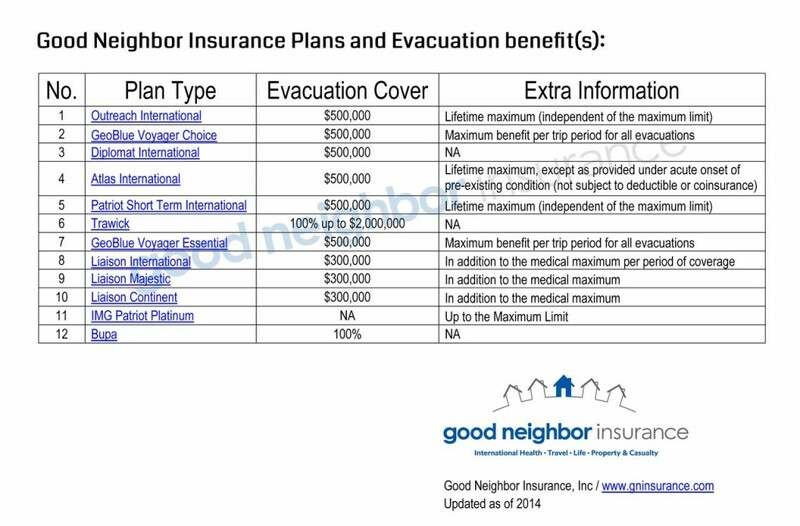 Here is a great chart (Also at https://www.gninsurance.com/wp-content/uploads/2014/07/Evacuation-Cover.pdf) with some of our travel insurance plans and their medical evacuation cover. 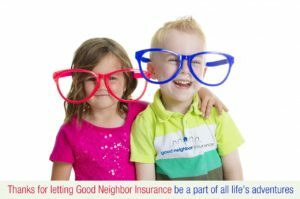 Call one of our professional international insurance agents here at our toll free number, 866-636-9100 / or our U.S. number at 480-633-9500 or email us at info@gninsurance.com.